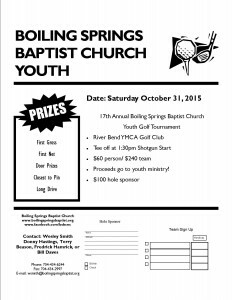 The Youth Ministry of Boiling Springs Baptist Church will host it’s 17th annual golf tournament, October 31, 2015, 1:30pm (shotgun start) at The River Bend YMCA Golf Club. The format is Captain’s Choice, four persons teams. Cost is $60 a person/ $240 per team. Hole sponsors are $100. If you would like to enter a team or sponsor a hole, please contact Donny Hastings, Wesley Smith, Fredick Hamrick, Bill Daves,Terry Beason, or Buddy Hamrick. You may also mail in a registration form to PO BOX 917, Boiling Springs, NC 28017. 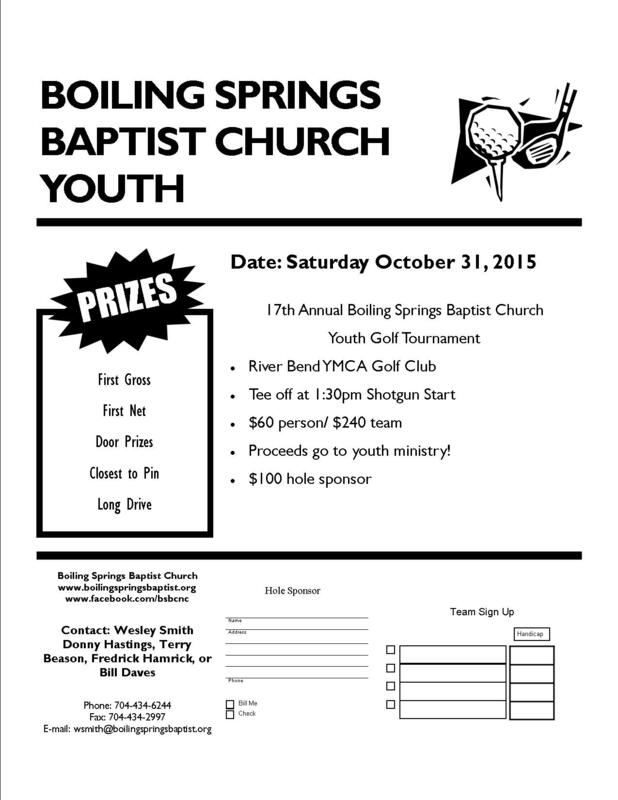 All proceeds go to our youth ministry.